I have arrived at the benefit, at the yield which modern Christian art can and must derive from symbolism, as defined. Well! First, to escape the "absurd alternative of the real and the ideal," to be conformed to the conditions, even unto the very definition of a work of art; to be at once decoration and expression, ornament and poetry; to flee trompe-l’oeil and falsehood; to be logical and truthful. If I have been well-understood, I should not be expected to define "truth in art" as being exactitude in reproducing natural objects. Concerning even painting and sculpture the which are, it must be insisted, imitative arts, truth consists in the work’s conformity with its means and its end. For too long, it has been customary to consider truth in art solely from the point of view of imitation. There is no paradox involved in maintaining, to the contrary, that trompe-l’oeil is synonymous with falsehood, and falsehood with the intent to deceive. A painting conforms to its truth, to the truth, in the measure in which it says well what it needs to say and fulfils its ornamental role. Decorative and edifying: that is what I wish, above all, for it to be. Loving, as I do enough, falsehood---in art, of course---notably the sumptuous and grandiloquent falsehood of Renaissance Italians, I can abide nothing but truth in religious art. It is for the church to be gulled that I fear most. What is it that we seek in Religion? Not a moral system, nor consolation, nor moving music, nor that mystery which flatters our intimate aspirations. No, we seek the truth. If Religion be false, I mock Religion. Very well, I wish to see nothing in church which is not true, which is not sincere, which is fake. When a preacher tells me edifying tales invented out of scraps, I become enraged: he is speaking from the cathedra of truth: he owes me Truth and nothing but the Truth. The idea of fakery, of hypocrisy and by extension of the word υποκριτης, (3) all which smells of the theatre, all which is redolent of the optics of theatre, thus the trompe-l’oeil, is shocking to a Christian. (3) The word in classical Greek means an actor. I cannot abide that in church, a painting should give the illusion of nature, nor that it should be a photographic and archaeological restitution, in the style of the Musée Grévin (4), of scenes drawn from the Scriptures. Likewise, should the figures you represent show affected sentiments, white eyes (5), the gesticulations of actors, I revolt, refusing to be duped. (4) The Musée Grévin is a waxworks museum in Paris. (5) 'des yeux blancs' - Denis may be referring to the eyes of holy persons lifted to the skies. I demand that, by means of an effort of transposition - by Symbolism! - you attempt at least to promote, to place on a higher level, the personages and sentiments thus represented; that you paint them so that they seem to be painted, submitted to the laws of painting, that they do not seek to fool my eyes or my spirit. This is what is meant by style. And this is what I call: Truth. If in another domain, leaving painting aside for the moment, were you to make gothic candelabra for me, Louis XIV grilles, Renaissance stalls, romanesque baptismal fonts, have I not the right to complain? I would know all that to be false, counterfeit. Do you want me to believe yours to be a thirteenth century lamp? But I see clearly that it is a similitude, that you have bought it on the Rue St.-Sulpice, that it is all shiny-new. Once more, you are deceiving me. Behold a church: it is "stylish," well-imitated from an ancient model. But I am aware it was built with reinforced concrete; your ribbing is plaster, being nothing needful for your structure. Your monument is a monolith which can stand on its own: why those barrel vaults? You want me to believe there are lateral forces and that your buttresses serve any purpose? That is all a pack of lies. Why don’t you build that church as you would your house? (as was done in the Middle Ages). Do you wish me to believe, because it is a church, that it is of the thirteenth century? Because it is the temple of truth, you construct a counterfeit of the past: a counterfeit you would condemn in an unscrupulous antiques dealer, which would even come under the condemnation of civil law? You would render as an homage unto God that which is condemned by man? And I say unto you: all falsehood, all attempts at trickery, do not belong in church. I scorn your electroplated goldsmithing, your faux-wood, your faux-marble, all that rubbish which is the common furnishing of modern churches. A wooden altar, of real wood, is more worthy of the Sacrifice than an altar of moulded cardboard wishing to appear as marble, prettified with faux goldwork. Let us respect the veracity and sincerity of God’s material creation. But let us all the more respect the sincerity of our thoughts. Let us avoid idolatry, that is to say the cult of self, the cult of the artist. The language meet for religious art is a language stripped of pride, of lies and, in consequence, of rhetoric. I resolutely reject, therefore, trompe-l’oeil and its accomplice, realism. I would observe that all such pagan intrusions into Christian art tend toward introducing idolatry, that is, the cult of an object which is its own goal, which is not the sign of an idea. "Similes illis fiant qui faciunt ea." While the method of true religion - announced in parables, perpetuated by the sacraments, shown forth in liturgy - leads us by means of the sensible to the supra-sensible. And that is also the symbolist method. Those pagan infiltrations are to be found in all epochs, even in the Middle Ages, where a sentiment of deep humility, of naïve and childlike faith, ever present, allows their passage. After the Renaissance we tolerate them less. What do those grandiose baroque machines symbolise, otherwise so seductive, besides the "joie de vivre" and contentment of the artist? To speak as the Gospel: they have received their reward. Let us accept, if we must, the pomposity and forced gesticulations of that period, the emphasis: they sometimes - often - are equivalent of a passionate sincerity. But let us with certainty note that trompe-l’oeil, as found in Italian churches, the floating away from the true toward the false which it inevitably engenders, the pride in virtuosity it displays, the absence of symbolic expression with which it is so easily satisfied, are incompatible with any sort of piety. On the contrary, the tapestries, windows, sculptures which decorate our cathedrals; in the Giottesque frescoes, the ordering of composition, the intimate geometry, the play of proportions, the magic of colours; contain the essentials of religious expression. No reproduction of a natural scene, no Biblical trickery, no pious photography, as sublime as one might suppose, can attain to that profundity, to that force of language. 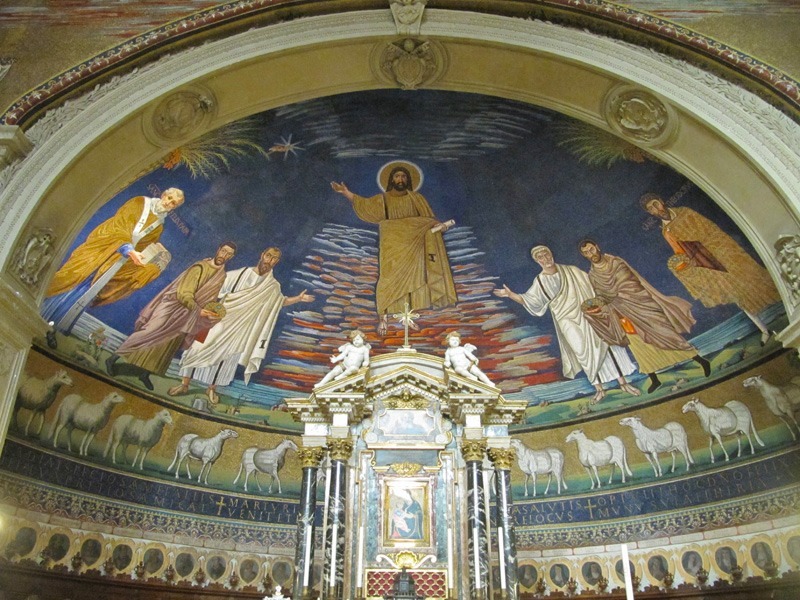 When the Byzantine mosaic artists invented those marvelous syntheses of Dogma visible at Ravenna and Rome, when they created the type of the Christ of Santa Pudenziana, or of SS. Cosmas and Damian, did they not illustrate and justify in advance the symbolist theory I have just expounded? Their Symbolism, truly plastic and architectural, far surpasses the allegorical graphism of the catacombs, which I cannot understand unless it is explained unto me. Emotion, on the contrary, seizes me before those magnificent poems, without needing an archaeologist or guide, and that emotion is a religious emotion. There is no better example of an art that by plastic means alone, by a gradual deprivation of the aid of imitation, obtains such plenitude of meaning, such perfection of beauty, such power of suggestion. Mosaic from the Church of SS Cosmas and Damien (formerly Temple of Romulus), Rome, 6th century.